Harbor Candy Shop started in 1956 almost by accident. When my father, George Sotiropoulos, brought me to Ogunquit to begin my first summer job at Bessie's Restaurant, he asked that I call home if I noticed any store-front for rent. He had a small confectionery manufacturing business in New Hampshire. Maybe I hoped there'd be nothing, for this was the great adventure of my first summer alone away from home. However, down Beach Street and over the bridge onto the beach was a "for rent" sign on a vacated fortune teller's shop in part of what is now Huckleberries. I called home. Thus, Lillian Sotiropoulos, my mother, spent that summer traveling by bus every day from Haverhill, Massachusetts to Ogunquit, Maine to run the new shop while my father made the candy in New Hampshire and used the family car to deliver it. The following year our family moved here for the summer season into today's Blue Water Inn on Ogunquit River, and a portion of the Inn was divided into a tiny candy factory. In 1958 manufacturing (and a small 2nd retail space) moved into the nostalgic Leavitt Theater building on Main Street which operates today as Ogunquit's only summer film theater. In 1960 Harbor Candy Shop moved to its present maroon and green Main Street building which had been an A&P Market painted originally fire-engine red and which has an interesting architectural history. 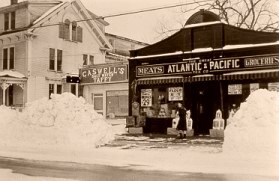 Within this block was the First National Store (now the Village Food Market), the old Tower's Pharmacy with its popular soda fountain (predecessor to Ogunquit Remedies) and the U.S. Post Office. Through many years and ever changing faces, Harbor Candy Shop still stands firm on the principles upon which it was founded. Our ingredients are carefully selected from superior quality chocolate to nuts meeting the best standards, to pure vanillas, butters and dairy cream, to fresh eggs from local hens that have some open air & freedom. We take those quality ingredients and add our pride and professional commitment. Hardly a summer day passes without hearing grandparents in the shop describing to their grandchildren the favorite candies they used to find at the shop on Ogunquit Beach and "the little Greek women" who worked there.